INSCT’s Homeland Security projects examine the law, policy, and operational challenges that have arisen from acts of terrorism and from natural and man-made disasters within the United States. INSCT is closely tracking the debate on the domestic use of Unmanned Aerial Vehicles (also called Unmanned Aerial Systems, or drones). The Domesticating the Drone website serves as a resource for those following—and influencing—US policymaking related to drones. It includes updates on federal, state, and local laws; think tank and government reports; and news and commentary related to the implications (to privacy and more) of aerial surveillance and other work being done by drones in US airspace. preSAGE applies four integrated perspectives—technology, security, economics, and law—to solve emerging problems of security, privacy, integrity, accountability, and functionality for critical infrastructure, the smart grid, and the “Internet of Things.” Central to the preSAGE project is a risk-assessment modality to build tools to design and test systems and protocols that will allow secure, reliable joint control of smart appliances and vehicles. INSCT has teamed with critical parties from across SU’s campus on this issue: Corporate Relations and Technical Alliances and the departments of Economics and Electrical Engineering and Computer Science. A collaboration between the Moynihan Institute of Global Affairs and INSCT, SoTechEM examines the use of social technologies (social media) by emergency management and response organizations that fall into one of five categories: fire departments, law enforcement agencies, emergency medical care providers, public health organizations, and executive emergency management departments. This project communicates EM social technology best practices and offers training programs to practitioners and policymakers. The Crisis and Disaster Management Research and Training Initiative at Syracuse University is a cross-campus, interdisciplinary initiative tasked with understanding the dynamics and processes that occur as policymakers, scientists, engineers, and citizens struggle to cope with crisis and disaster situations. Participants in the group include faculty from engineering, the social sciences, computer science, public communications, and law. In addition to carrying out research on topics such as physical and social resilience, risk analysis, decision-making, and geospatial representation, the group also provides training to the practitioner community. 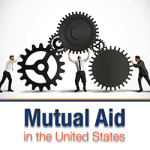 The Mutual Aid in the United States project tracks policy developments related to interstate and intrastate mutual aid systems. Sharing resources smoothly and efficiently during a crisis is vital to our nation’s resilience. The Emergency Management Assistance Compact (EMAC) serves as the primary mechanisms for sharing resources between states. Intrastate mutual aid systems provide for effective local response, and facilitate response efforts coordinated through the EMAC system.